Take yourself back to medieval times, when battles were fought by the firepower of cannons from castles and ships, where warriors invaded the coasts to take over the first available stronghold and attempt to work their way over land, looting and pillaging and sacking along the way. Sounds pretty sweet, huh? Well, actually, Rampart is a pretty sweet game, and it's one of those you can just pick up and play without too much hassle. In fact, that's exactly what you should do. Right now. OK, it wouldn't be much of a review if I wrote that and signed off at this point, so I guess I should try and sell this to you. The concept is simple. Retain at least one castle after each round of battle to stay alive. To retain a castle, it must simply lie inside a walled-off area. 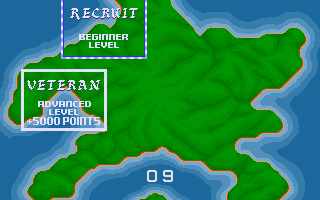 From the beginning, then... you're given a choice of maps to begin with, Recruit or Advanced. Basic difference is that the battles will start with the harder enemies much earlier if you choose advanced. Let's assume you start with the Recruit level, it'll be easier to explain. So, we zoom into the first terrain, which is divided about 50/50 between land and sea, and on the land is a selection of castles. 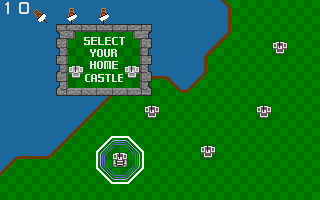 Your first task is to choose a castle, around which will magically appear several walls. 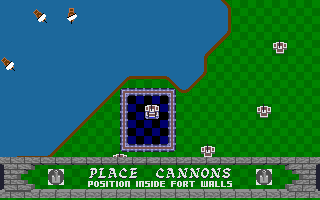 The next stage is to place your cannons inside the castle walls. You might have noticed that while you were doing this, some ships started appearing in the water... There is a time limit, but more likely you'll have put your cannons down well before that expires. 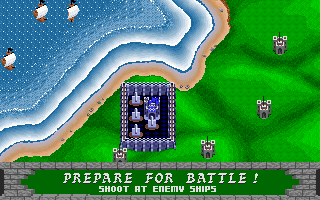 Then begins the battle, here you must attempt to shoot the ships until they sink. The graphics change from a directly overhead view to a pseudo-3d view, and it's here where you can see the sprites are well detailed and perfectly formed. The boats will fire back at you, destroying your walls (don't worry, it seems the actual castle and cannons are invulnerable), whilst also trying to make landfall. The battles are short, but intense, ending either after only a few seconds, or when all enemy boats are destroyed. Then follows what is both the most important part of the game, and also the most frustrating... rebuilding. Fail to surround a castle and the game is over (apart from the continue option, but I'll come to that shortly). If you surround a castle but no cannons, you'll have no firepower for the next round, but at least you'll live. Surround more than one castle and you'll get more points, and possibly even more cannons to place on the next round. The pieces are Tetris-like, and can be rotated before being placed. The time limit is kind of tight, though. Don't muck around! And that's it. Survive long enough and you can take on the next level, fail to surround your castle and you'll get another chance with upgraded cannons (the well-detailed graphics show them developing from typical medieval "barrel" cannons to modern artillery guns! ), until eventually it becomes apparent you're just not going to do it, in which case you will probably face execution. Well, it's not quite it, I suppose... the longer you play, the tougher the game gets. The ships will arrive faster, deploy ground troops faster (they can destroy castles, so you'll need to try and block them off, or you can cannon them), and some ships will fire flaming cannonballs which will leave a fiery crater, over which you can't build during the repair phase. The maps always look pretty simple, but you'll also have more complex building shapes to contend with during the repair stage, making life harder again for you. 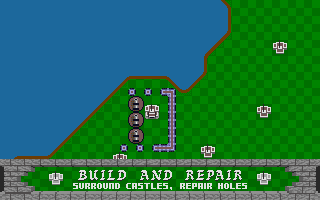 Also the AI has a habit of perforating your castle walls, rather than demolishing large sections, which makes the crucial rebuilding phase just that little bit harder and more frustrating still. 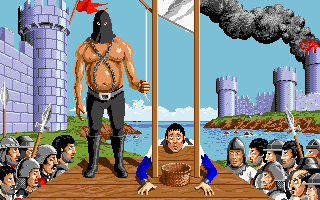 The game's been ported across many different platforms, PC, GBA, even the Spectrum I believe, but the best version was without doubt the Amiga version. There was even 2-player support, which was actually pretty good fun too. You know what would be good? An MMO version. It's addictive, it's fast, it's furious, it's frustrating. And it's well worth checking out if you haven't already. I love this kind of fast-paced strategy game. Modern RTS are a little too cluttered and over-complicated for my liking (you have to spend months on end practising to be any good) and Tower Defense games are too plodding and predictable, but this really hits the sweet spot. 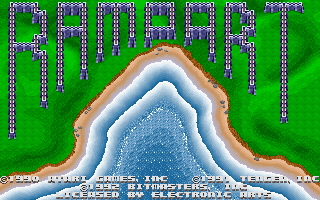 You need quick thinking and dexterity to get anywhere with Rampart, and it's incredibly simple to grasp, yet difficult to master, like all the best arcade games. Nice review, oh fishy one!